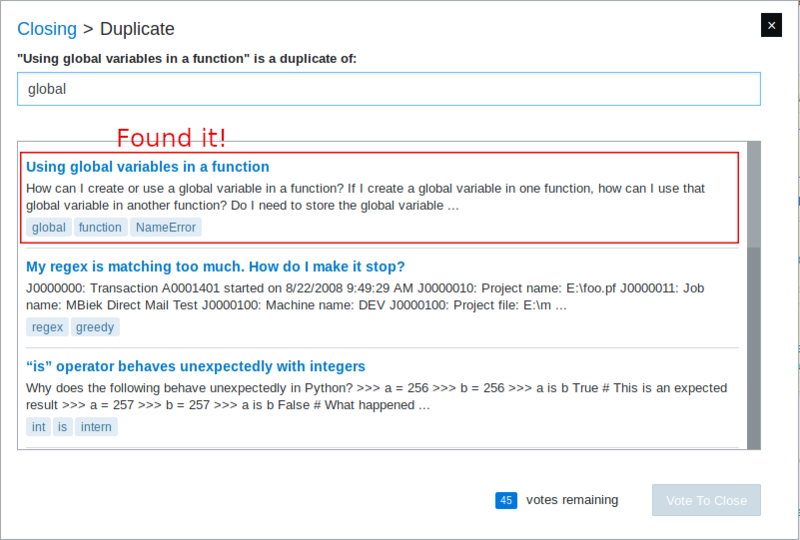 This is a userscript that lets you mark questions as commonly used duplicate targets, and replaces the default question search in the close dialog with one that searches through your marked duplicate targets. Once a question has been added to your collection, you can associate keywords with that question. These keywords are intended to make the question easier to find. Please post bug reports and feature requests on my GitHub issue tracker. Not sure which posts you should setup with this script? I made a quick SEDE query to help you find common duplicate target posts for your tag of choice. TopItems it the max items you want back. Probably good to leave this less than 50. TargetTag is the display name of the tag you want duplicate target posts to contain. For example, c# (rather than the URL encoded version). The results are the most common duplicate targets for that tag, ordered by how often they are linked, descending order. Not the answer you're looking for? Browse other questions tagged script questions closing duplicates .